Read the quick Amazon blurb here and then click on the pic of the book or the title if you are interested in finding out more. USA Today Best Selling Author. First Book in this series. Misty Williams has finally achieved her dream of opening a teahouse in Whistler's Cove, a small town famous for its community of artists and crafters. But when the local gallery owner, Hilary Small, is poisoned in Misty's teahouse, and it begins to look as if the man Misty is in love with committed the murder, Misty must turn amateur sleuth in order to save the reputation of her teahouse and her hopes for romance. Set in an enchanting location, this cozy mystery will delight with its entertaining cast of humorous characters, including Misty's cat Miss Mabel, who plays a crucial part in revealing the true murderer. Felicity turns her back on her investigative journalism degree to start a business as a party planner. When her friend is accused of murder, her inquisitive nature is rekindled and she quickly becomes Senoia’s premier super sleuth. She quickly finds herself involved in murder mystery after murder mystery. If she is going to save her friends, and herself, she must solve everything from crimes of passion to mass murders. Can Felicity overcome long odds or will it be too much for the young party planner? The 1st book in the Juniper Grove Mystery Series! I haven't read a cosy mystery for a long time, I used to love the No1 Ladies Detective Agency. But at only 99p, it's definitely worth giving these a go, thanks. I really like the sound of the first two books. Cherry Pie or Die is an 'interesting' title! I have not heard of any of those books! I may have to check them out when I finish some of what I'm already reading. LOL Maybe I shouldn't wait. Blessings to you! I'm your neighbor at #TrekkingThru. I love cozy mysteries! These look good! Thanks for sharing this at Booknificent Thursday on Mommynificent.com! I love a good mystery! Thanks for sharing these. This is a nice group of mysteries. I'm always looking for a book to add to my kindle--unfortunately the kindle editions here are only available in the UK. These sound like interesting books! Thanks for sharing with us at the #LMMLinkup! Blessings to you! Thanks for sharing. 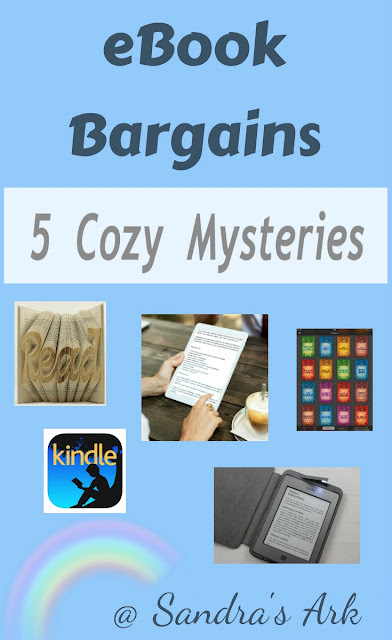 Cozy mysteries are a fun, relaxing read. Having got really into reading again lately I've had to question my budget for books- definitely need to dust off my e Reader and look up some of these bargains! Thanks! Pinned to #CoolMumClub reading list!